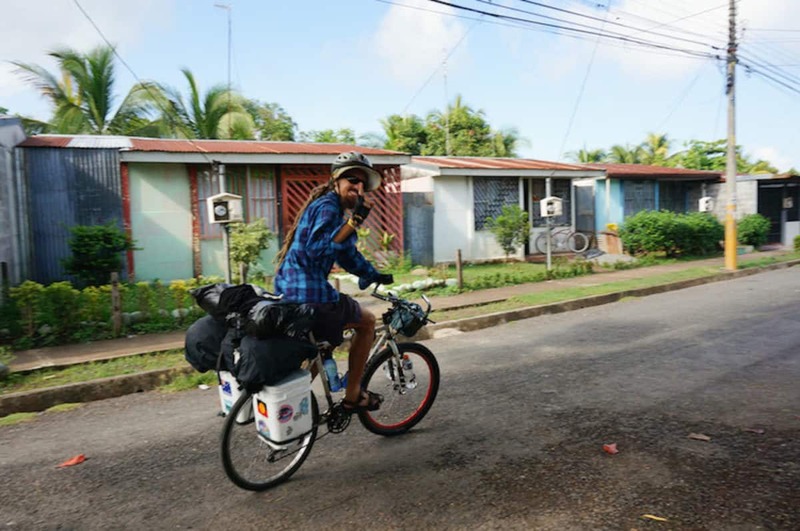 So you want to travel the world by bicycle? In a previous article, we’ve already talked about the essential gear you need for you first bike tour. But, you don’t have much money? No worries, you don’t need to spend your life savings gearing up for your tour. 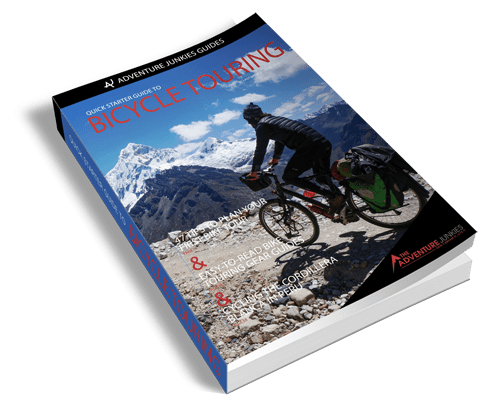 Here are some awesome alternatives to expensive bicycle touring gear that will inspire you to get out the door and on the road today. Can’t spring for Ortlieb panniers? A full set brand new can cost over $300. So why not make your own? All you need is two buckets and some creativity. 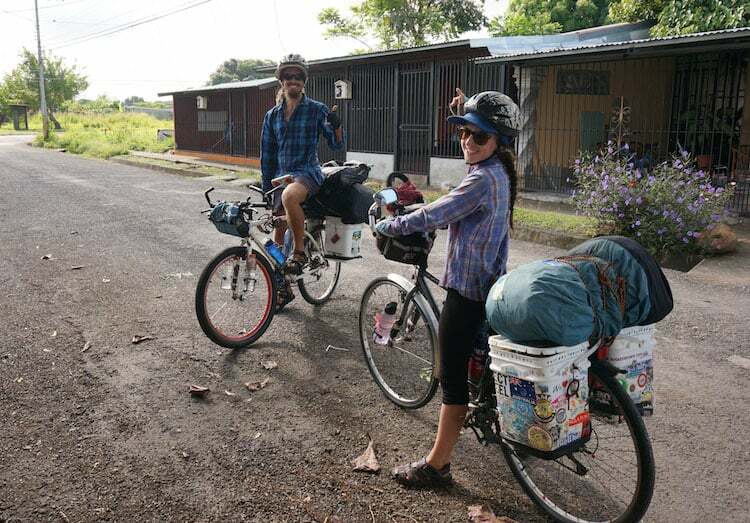 Here’s Brenna and Pepe, two Aussie cyclists we met in Costa Rica. 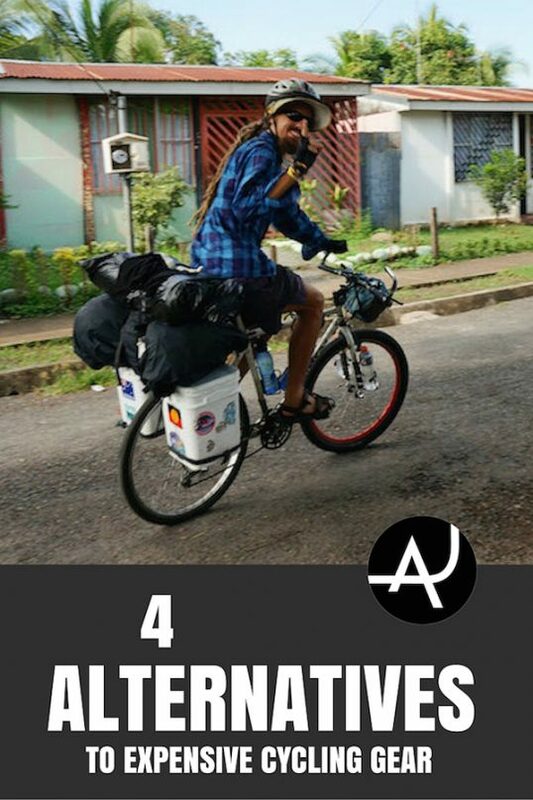 They constructed their panniers out of buckets they found, making their project costs $0. But wait there’s more! 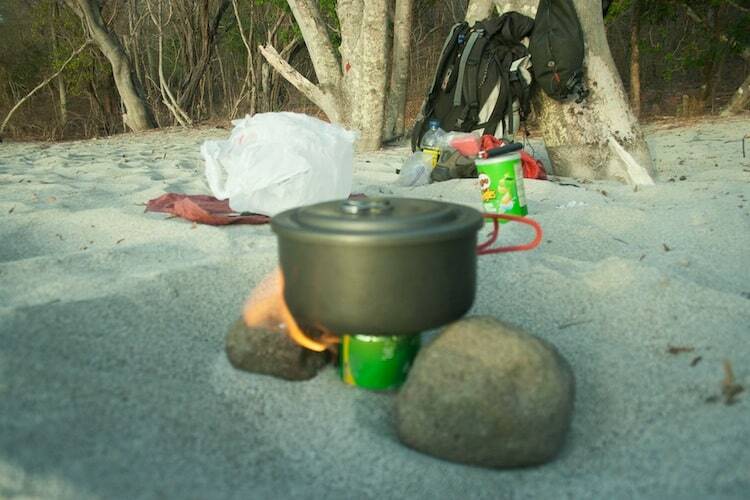 The buckets function as a great set of table and chairs. They are waterproof and resistant. If they break down just find some more buckets. Want to make your own? Find out how to here. 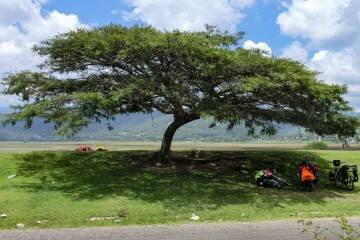 You don’t need a top of the line bike to explore the world, any old bike will do the job. 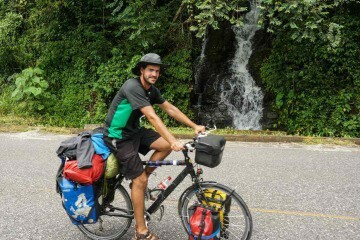 We met a man in Belize who toured all of South America on a bike he found in a ditch! He even showed us the alpaca skin that he carried on the bike all the from Peru back to Belize. 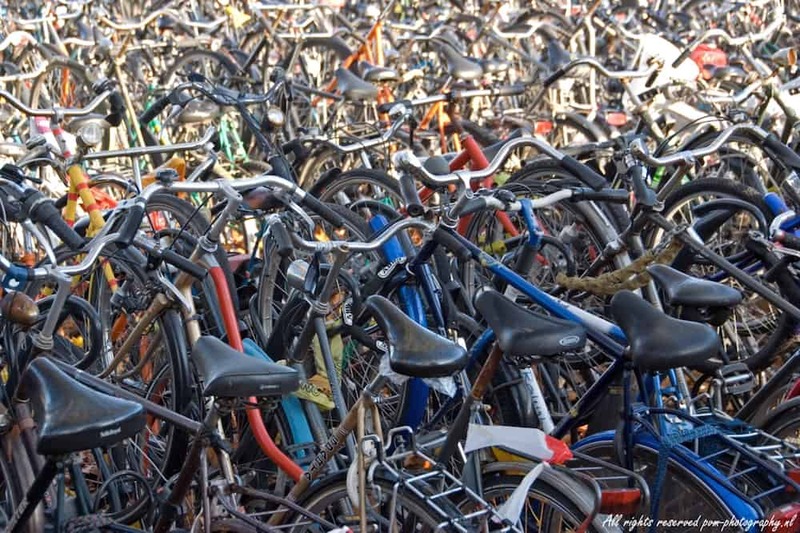 If you don’t have any luck finding a bike in a ditch check out yard sales and second hand stores. You will most likely need to make some modifications or repairs but the cost will be much lower than that of a new bike. Here is a great article by Travelling Two that is all about how to choose a used touring bike. A Primus or MSR multi-fuel stove can cost hundreds of dollars. One of the easiest and cheapest ways to cook while on the road is to make your very own stove using only a soda can and alcohol. The total cost of constructing the stove is $0. If you step into an outdoor store to buy a lightweight backpacking tent you can easy be discouraged by the high prices. A top of the line tent can cost you over $500. 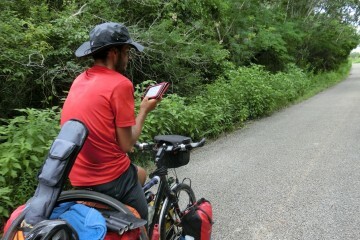 Don’t let that get you down because you don’t really need the best tent in the world to use while bicycle touring. Just like for the bike check out yard sales and online buy and sale websites. Also get in touch with retailers and companies to ask if they have any tents that they were using as displays. Often times these will be heavily discounted. An alternative to buying a tent all together is to get a camping hammock. 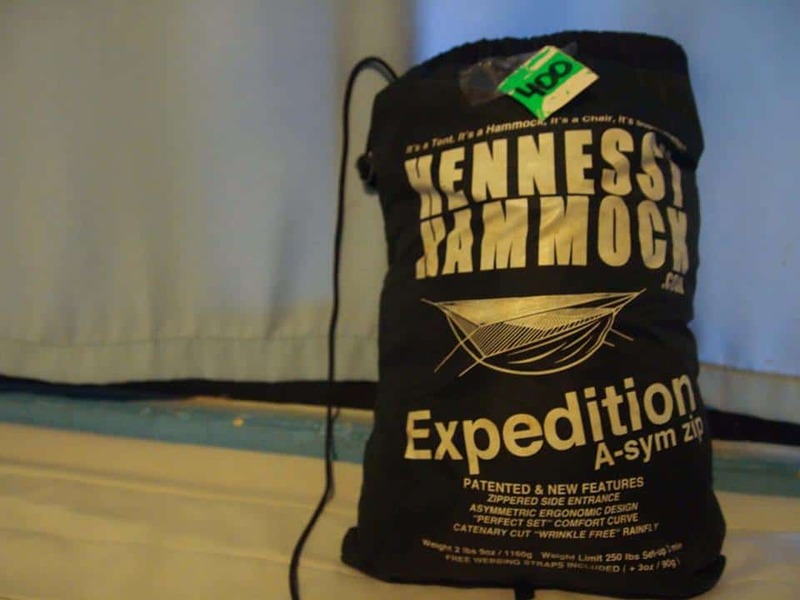 I bought a Hennessy Hammock in a pawn shop in Mexico for 350 pesos / 24USD (the lady even gave me a discount!). This model of hammock goes for $219.00 new. It has a mosquito net and a waterproof rain fly. All you need to do is find two poles or trees to hang it from and you are set! Don’t forget to check our 14 free places to sleep while bicycle touring. If you want to go ultra lightweight or just don’t have the money to buy a tent, go without one. We’ve met many cyclists who don’t even bother carrying one for short trips. They just have a tarp and mattress.